A far more affordable price point and bigger range of compatible tools makes Console 1 look like an appealing proposition. Comes with excellent SSL-modelled mixing tools. Still requires ‘buying into’ the platform to get the most out of it. Released in 2014, Console 1 marked the first step into the hardware realm for Softube. 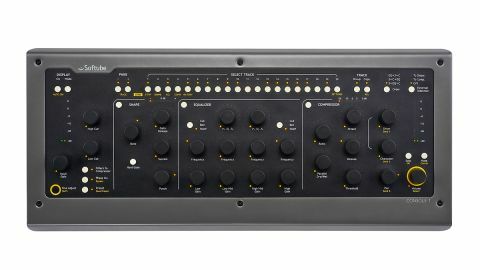 In a nutshell, it was a hybrid mixing platform - a MIDI controller designed specifically for tight integration with an SSL-modelled channel strip plugin. Back then, the main criticism of Console 1 centred on its price. At just shy of £700, it was a serious investment, even given its impressive quality. Fortunately, with this MkII refresh, Softube has rectified this significantly, dropping the price to a far more reasonable £439. So what else has changed? The short answer is, not much - but that’s fine. There have been a few small tweaks to the hardware, adding brighter LEDs and rearranging the interface slightly, but the differences are barely noticeable, which is a major positive, given that significant drop in price. Workflow-wise too, things are pretty much the same. The plugin works best when placed across every channel in a project. Console 1 then creates a virtual console, with the track selector buttons on the hardware used to flip between individual channel strips. Each strip is in modular sections for shape (ie, transient control and gating), EQ and compression. Out the box these can be filled with Console 1’s stock processors, based on the SL 4000 E. These sound excellent and offer a flexible mixing experience with quality sound. The interaction between the hardware controller and neatly designed software interface is pretty much flawless too. The Console 1 system can be expanded, however, with a growing range of compatible plugins. The other big update for MkII is the addition of a number of Universal Audio plugins to this list. While the platform can’t host UAD plugins in the true sense - you’ll still need UA DSP to run them - they do tightly integrate into the platform and can be controlled via the hardware. This range of expansions is key to Console 1’s success; while it can be mapped to other software, and integrates with Studio One and Sonar, the platform is really designed to bypass your DAW’s mixing capabilities entirely. Because of this, it’s a system you’ll want to fully buy into; it feels like you’re missing the point if you have to flip back and forth between Console 1 and non-compatible plugins. Between the 60 (universally high quality) Softube and UAD plugins now ready to be used with the system, it’s hard to imagine any bases not being covered. It’s still an investment, but at this new price point - and still including a quality controller and excellent virtual console - Console 1 is now considerably more appealing, particularly for existing users of Softube and UAD plugins.